This was our first ever holiday with Sunshine (a.k.a. Theo, our 5 month old son). 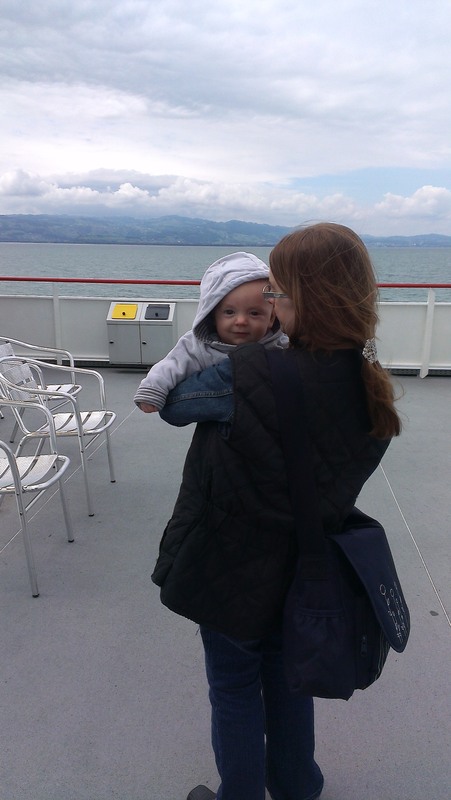 We live in Stuttgart, in Germany, so for us, Lake Constance was an easy 2.5 hour drive away. My in-laws had recommended a good hotel in Wasserburg, 6km from the historic town of Lindau, so it seemed like a safe option. 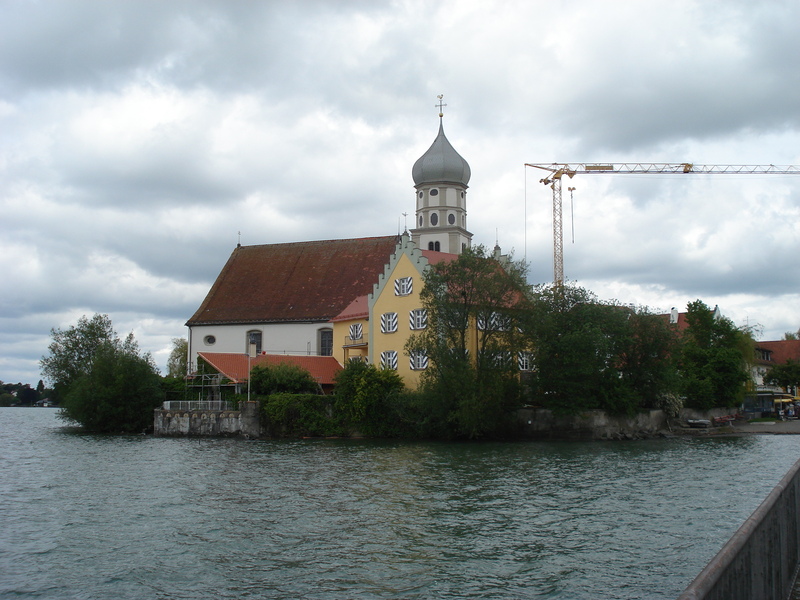 Lake Constance itself forms part of the southern border of Germany, with Austria and Switzerland on its other sides. The lake is big, about 65 km from end to end and 14 km wide, and enjoys a special climate, making it a great fruit and vegetable-growing area (Dads take note: hops are big business here). If the weather is good, amazing views of the Alps present themselves, and there are plenty of trips to be had on the ferries (all very well organised, but this IS Germany!). If you aren’t lucky enough to live a shortish drive away like us, you can fly Ryanair from the UK to Friedrichshafen (alternatively there are airports at Memmingen, Munich, Stuttgart and Zürich). 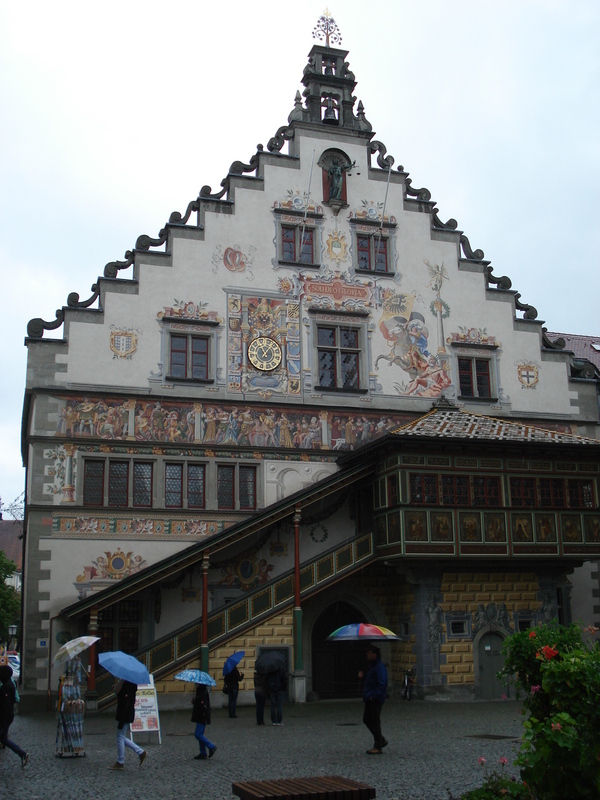 You can then travel onwards by rail to Lindau or pick up a car. The region is well-situated in road terms, being on a major north-south motorway axis (from Germany, through Austria and on into Switzerland and Italy). OK, cards on the table time here. By sheer misfortune, the weekend we went (end of May/early June) was marked by some of the worst rain in decades. This meant that we were somewhat hampered in what we could do. Lindau is a wonderful old place. Admittedly, the first time, we were dashing from shop to shop avoiding the rain, but it still left an impression. There are plenty of lanes to wander around and enjoy. As with many towns and cities of the same period, it is a place which simply seeps history, without you (and more importantly, your kids) having to go into a museum to learn about it. A tip: grab a drink or a snack is the Marmorsaal, right on the quayside by the ferry (part of the station building). It’s a bit “shabby chic” but the beer is good and the service friendly and quick. 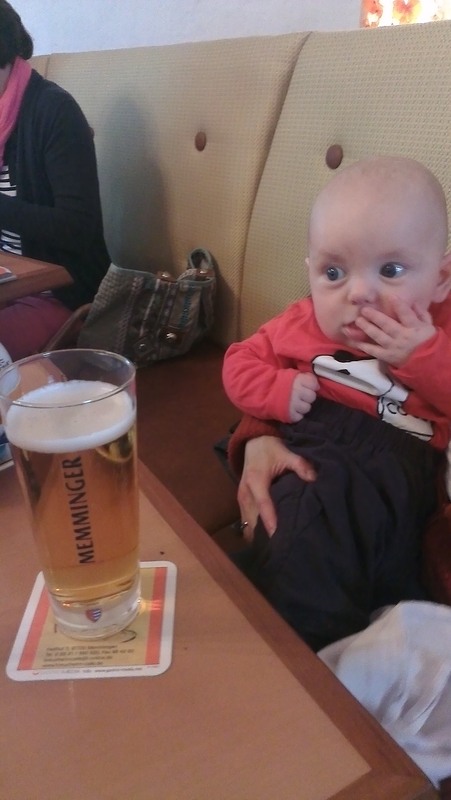 There were also no issues with my wife, Marion, feeding Theo or changing his nappy there (you’ll generally find that Germans are very relaxed about dealing with babies). If you’re looking for a real taste of the area, the Käseecke (located behind the town hall) is a real gem. We found it quite by chance and it is operated by a cheese sommelier, no less. It’s a small shop which does cheese boards and stuff to take away. They had no issues with Theo being there and were very friendly. Whilst in the region, we also visited Memmingen. The architecture is stunning and there are loads of lanes to wander around – the Kreuzherrn Café, a Gothic gem, makes a great stop. There is a cool toy store right opposite the town hall – lots of stuff for children of all ages (even those who have past 30…) – which can fill time, especially if it’s raining. We also went to the Buxheim Monastery, 4 km west of Memmingen. One of the few Carthusian monasteries in this world (run from La Grande Chartreuse near Grenoble), it is a Baroque gem with huge cloisters and an amazing abbey church. Practically no stairs either, which is great with a pram or buggy. One place we didn’t go (Theo is just too young) but would be great for kids, is the Ravensburger Spieleland, about 30 km to the north of Wasserburg. Ravensburger may well be a name you know from your kids’ puzzles and games and their world of adventure is located, guess what, in the town of Ravensburg. a visit to Liechtenstein, one of Europe’s smallest countries, for sheer novelty value! a visit to the Neuschwanstein Castle of “Mad” King Ludwig of Bavaria, located close to Füssen (you can pretend it’s Disneyland). Finally, the Allgäu, the region between Lindau and Ulm is marked by lush, green rolling hills and there are great walking and cycling to be had, as well as plenty of dairy farms to stock up on cheese or to pet the animals. 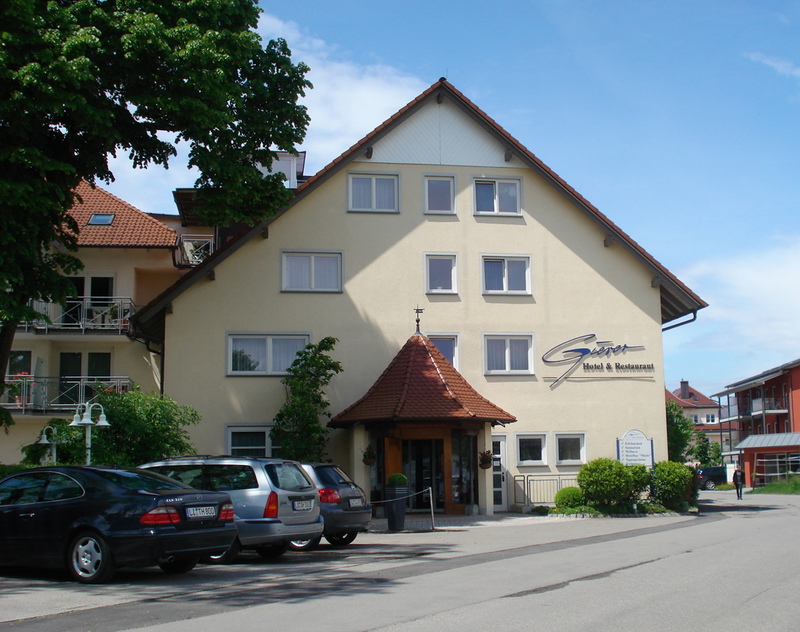 We chose the hotel, the Gierer, because my parents-in-law had stayed there before. For a hotel claiming to be a “country hotel”, it was all a little modern, but still very welcoming. It is located in a hamlet just off a main road, meaning that there are no shops or anything around. So, once there, you are kind of stuck (unless you don’t mind a longish walk or drive into the village, where you’ll find a supermarket and plenty of shops and cafes). We were given a family room, which was actually one of the biggest rooms we had ever stayed in. There was an extra bed in the room (not that we needed it), but there was still plenty of space for the pram, a mattress for Theo and a big bed for us to conk out on at the end of the day). The hotel has its own spa area (pool, steam room, sauna, etc. ), which is very well appointed and clean, and free for guests. Theo protested loudly when we entered, probably because he was not used to humid heat. (As such, we took it in turns to use the facilities…!). As to eating, we initially opted for half-board. However, our babyphone did not work in the dining room, so we promptly cancelled that and ate in the Weinstube next door. The hotel food is very good – half-board dinner is high quality if a little lacking in thrills – and breakfast will fill you up for most of the day. The family running the hotel has its own brewery too and the beer is very drinkable (someone had to try it!). This entry was posted in Destination guides, Europe and tagged Bavaria family holidays, family holidays Germany, Germany with kids, Hotel Gieger, Lake Constance holidays. Bookmark the permalink.